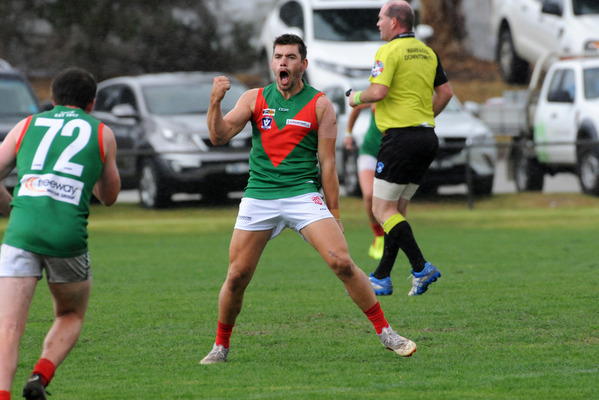 Tooradin-Dalmore rebounded quickly from its first-up loss to Cora Lynn on the opening night of the season with a gritty, steadfast 11-point win over Nar Nar Goon at Spencer Street on Saturday afternoon – 9.12 (66) to 8.7 (55). 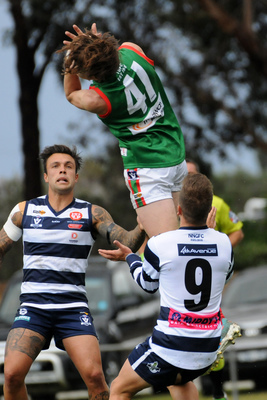 In a wintry clash that went back and forth all day, the Gulls had to fight tooth and nail for the four points – which would have pleased coach Lachie Gillespie no end. Luke McKenna backed up the outstanding form he showed in his side’s return to West Gippsland football against the Cobras with another impressive, best on ground showing against the Goon; while the likes of Julian Suarez and skipper Matt Livermore were also particularly influential on the contest. Almost fittingly, former North Melbourne utility Lachy Hansen – a Nar Nar Goon favourite son – booted the first goal of the contest with his first kick, while the likes of Jake Smith, Brendan Hermann, and Trent Armour stood tall for the home side. The Goon has gone back to the future in a couple of ways this season – one being the return of its traditional ‘hoops’ guernsey. In the wake of the clash, Gillespie told the Gazette his side handled Saturday’s tricky conditions well. “They don’t really bother us too much,” he said. “We’ve got some pretty strong bodies, and wet weather footy is probably more about the simple things – putting your head over the footy and winning it. Gillespie said that Saturday, like in the season-opener against Cora Lynn, was about learning and adjusting to the different teams in the WGFNC. “That’s probably where we’re at, at this stage,” he said. “I think we adjusted a little bit quicker. They kicked a couple of really early goals straight out of the blocks and I think we barely touched the footy for the first three or four minutes. “That was a real worry, but to the boys’ credit they adjusted really quickly and we spoke during the week about being able to do that. Gillespie acknowledged that his side’s kicking for goal was “pretty atrocious”, particularly in the early-going. “The Goon missed some too – everyone did in those conditions – but we missed some really basic ones,” he said. The Goon kicked a couple of early goals in the fourth and put the Gulls squarely under the pump. “They actually hit the lead, but we toughed it out and got back on top but it would have been nice to maybe be a little bit further ahead,” Gillespie said. “Against Cora Lynn we were the opposite – we went back into our shells. “I think as a team the players drove the turnaround – not so much the coaching staff. “When the moments came during the game, the boys did stand up which just gives them confidence to know that we have learnt from it (the Cora Lynn game). “We had to clean up our stoppages (from the first game) – Cora Lynn bullied us and Bill (Billy Thomas) is a great ruckman and he gave their mids first use. “I think we rectified that a lot this week – our forward entries as well, and giving ourselves options to score. Gillespie’s footy roots are deeply entrenched in West Gippsland, and he spoke about how thrilled he is to see his club as part of the WGFNC. “It’s a great feeling – we just love it,” he said. “It sounds ridiculous, but even things like driving down through the country roads – to me it feels like home. I played all my juniors and seniors through West Gippsland until we went to Casey Cardinia, and to me it’s home. “This is where I remember playing as an 11-year-old and there’s a really nice feeling about it. 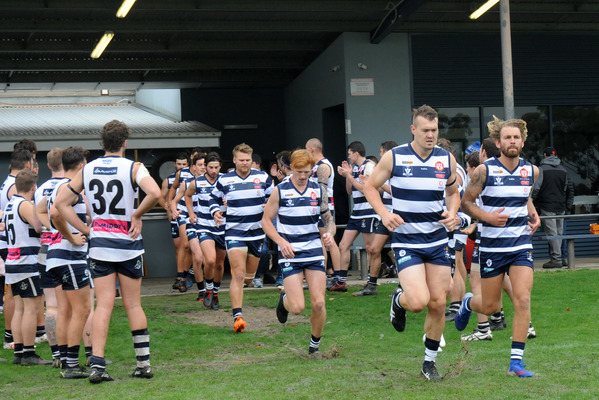 Gillespie admitted that against the likes of Narre Warren, Berwick, Beaconsfield, and Cranbourne in the former SEFNL competition there was a certain way that his side had to try and play in order to stop them piling on the scores. But now, in West Gippsland, a mindset change is almost required – to know they can push the competition’s best with their own brand of footy. “In the South East (SENFL) those top four sides had incredibly strong depth,” he said. “They had these superstar kids coming through the ranks, but we had one, two or three injuries and were right under the pump. “The way we look at it now is totally different. I feel like this league is much more even, but that goes both ways – if you’re not on, as we found out against Cora Lynn, you’ll get smashed but if you come out and play your own brand of footy you can put yourself right up there. “Nar Nar Goon could have won very easily, and I think they’ll be one of the top sides.